I checked in to 6 places, took 1 photo, wrote 4 microblogs, and walked 6.6 miles. I was in Chicago and Des Moines. 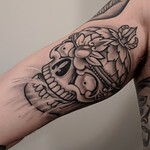 Healed tibetan skull on my inner bicep.